A couple of days after holding the groundbreaking ceremony of Gigafactory 3 in Shanghai, Elon Musk met with Chinese Premier Li Keqiang in Beijing. 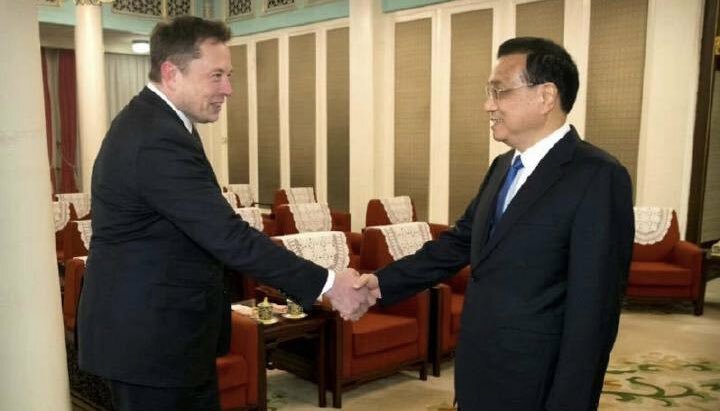 Li, widely regarded as China’s #2 after President Xi Jinping, spoke candidly with Musk, discussing his optimism about Gigafactory 3 and the innovations that Tesla can bring to the table by producing its electric cars in the Asian economic superpower. Tesla’s skeptics would best be worried at this point. Musk, after all, continually faces a barrage of criticism — some warranted, most unwarranted — from the United States’ mainstream media and groups of individuals who stand to gain from the company’s decline. This is particularly notable in platforms such as Twitter, which sees daily debates between the TSLA community, who support Musk and his ventures, and the TSLAQ group, who oppose the serial tech entrepreneur. In the United States, at least, Tesla is a widely polarizing company, and Elon Musk is a favorite target for those who oppose his work and what he stands for. This does not seem to be the case in China. During his talk with the Chinese Premier, Musk openly noted that the country’s speed of development and efficiency are impressive. As pointed out in a China Government Network report, Musk said that “Tesla will strive to build the Shanghai factory into the world’s most advanced factories.” When asked by Li what Musk meant by “most advanced,” the CEO noted that the description would be true for both Gigafactory 3 itself and the vehicles that it would manufacture. Musk further noted that he is hoping to make the Shanghai Gigafactory a global example of a facility that functions almost like a “living being.” Later on, the Chinese premier welcomed Musk’s ideas, even comparing the Tesla CEO to the late Steve Jobs, who revolutionized the mobile industry with the iPhone. “If you do have this idea, then we can issue you a ‘Chinese Green Card.’ Your idea is similar to Apple’s founder Steve Jobs. Steve Jobs is inspired by the oriental Zen culture originated from China and optimized the interface of Apple’s mobile phone,” Li said. It should be noted that Elon Musk and the Chinese Premier held a meeting at the Tower of Violet Light in Beijing — a place usually reserved for the country’s most distinguished guests. In a way, it is no exaggeration to state that Musk received a welcome worthy of a foreign dignitary by the Chinese government. Considering that Musk is a foreign automaker CEO, such warm reception does indicate the country’s open support for Tesla and Gigafactory 3. In a way, Tesla’s presence in Shanghai is beneficial to the country. China, after all, is aggressively pushing the adoption of renewable energy, and among its initiatives is a significant shift towards electric mobility. In this light, having well-known and daring innovators such as Elon Musk on the country’s side would help China reach its ambitious goals, one of which is to sell 7 million electric or hybrid vehicles annually by 2025. In a statement to Xinhua News, Cui Dongshu, secretary general of the China Passenger Car Association described Elon Musk and the Gigafactory 3’s effect on the Chinese EV industry. “Tesla’s China production will have a ‘catfish effect’ in the country’s auto industry, pushing domestic carmakers to speed up their technological upgrading,” Cui said. That said, the United States media has recently begun adopting a somewhat friendlier stance on Musk and Tesla. While there is still a healthy stream of negative articles about the company and its CEO, some notable personalities from mainstream media such as CNBC’s Becky Quick appear to be turning a new page. During a segment featuring fellow CNBC host Phil LeBeau in Gigafactory 1, for one, Quick admitted that she does tend to “short-change” Elon Musk. “We tend to kinda short-change Elon Musk with all the things he’s done with the Gigafactory, Tesla, the rockets, The Boring Company. Seeing it in action gives you a slightly different perspective, I would guess,” she said. Fox Business‘ Stuart Varney, one of Musk’s more vocal critics in the past, has also taken a friendlier stance on the Tesla and SpaceX CEO. Addressing his audience, Varney noted that it is now time to “re-evaluate” Elon Musk. “I think it’s time for a re-evaluation. I think it’s time to look at the man’s achievements, rather than his public image. Like him or not, Elon Musk is surely the prime example of a brilliant entrepreneur. He makes state-of-the-art electric cars. He had the vision. A lot of people talk about their “vision,” but he went out and did it. You’ve heard of SpaceX. That’s an Elon Musk company. He had a vision for reusable rockets, and he went out and did that, too… That’s an achievement. There is little doubt that Elon Musk is one of the world’s most notable innovators today. If the reception he received during Gigafactory 3’s groundbreaking is any indication, it appears that he is well-supported in China. It remains to be seen if this same reception would be extended in the country Musk currently calls his home. As for Musk’s skeptics, this might be a very bad time to bet against the man.